Designed to be as versatile as possible for all varieties of jobs such as belly clipping, dirty cattle clipping and even light shearing. 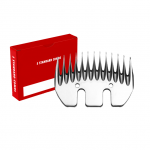 76mm wide, 5mm medium bevel combs. The most popular type of comb for UK sheep breeds. Ideal for both the farmer who does his own shearing and contract shearers alike. 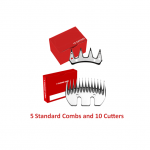 5 standard combs and 10 cutters.